NBAE/Getty Images Despite playing with a sore right wrist, Dwyane Wade scored 25 points and gave out seven assists. MIAMI -- Welcome to the fork in the road. We have two potential paths for the rest of Miami's season, and it's an open question as to which direction it will go. The first possibility is that the Heat's improved supporting cast, paired with the usual dose of awesomeness from Dwyane Wade, will propel Miami to a top-five seed in the East and perhaps a run into the second round of the playoffs. The alternate one, however, is that the Heat's upgrades will be made irrelevant by a decline in Wade's numbers, leaving Miami right back where it was a last season as mediocre, first-round roadkill. The one certainty in that picture is that Wade has more help than he did last season, something the 11 other Heat players proved again Thursday. While superstars Wade and Dwight Howard played to a draw, Miami's supporting cast beat the tar out of the more highly touted Magic ensemble, leading by 29 points after three quarters en route to a 104-86 win. • Center Jermaine O'Neal looks as healthy and active as he has in years. He's providing his usual toughness at the defensive end while shooting 56.2 percent from the floor and upping his rebound rate. • Quentin Richardson has stabilized an open sore at small forward after losing about 10 pounds for every time he was traded this summer, as well as providing a floor spacer with his 3-point shooting. • After a half-decade of idle threats, Miami finally has put Dorell Wright into the rotation and is getting results. He's providing a quality midrange shooter and energy player off the bench, including Thursday's 11 points and eight boards in 26 minutes. • Udonis Haslem might not score enough to be an ideal starter, but now that he's the first big man off the bench, his defense, toughness and ability to make open shots make him a strong weapon. • Haslem can come off the pine because of Michael Beasley. While he's had his ups and downs, especially when he has to play on the wing, he's providing nearly a point every two minutes at the ripe old age of 20, and his defense has improved considerably from last season. "You can't just pick on him anymore," Magic coach Stan Van Gundy said before the game. • Finally, the switch of Carlos Arroyo to the starting unit, intended mainly as punishment for the frequent tardiness of Mario Chalmers, might have the unintended effect of getting better shots for O'Neal and Beasley with the first group. Arroyo had seven assists and no turnovers in 26 minutes Thursday, while Chalmers' scoring instincts seem better paired with the offense-starved second unit. Don't look now, but the support crew has the Heat at 13-11, with a winning road record, even though Wade's numbers are way down from last season. And that's where we get to the other part of the story. Wade was MVP caliber in 2008-09 but has been considerably short of that standard this season. He entered Thursday shooting only 42.7 percent from the floor, down from last season's 49.1 percent, with a resultant decline of 3.5 points per game off his league-leading scoring average. Just this week, Heat team president Pat Riley mentioned that he didn't think Wade's conditioning was at the level it was a year ago, and that wasn't news to observers in South Florida. While Wade still has been brilliant by the standards of mere mortals, he hasn't seemed to have the same lift or energy. Locals openly wonder whether he's coasting through this season while he waits for the Heat to bring in some help in free agency. At first glance, it's hard to find any dip in athleticism or energy from Wade's numbers. He is shooting the exact same proportion of shots as he did last season, according to 82games.com: 66 percent jumpers, 25 percent close range, 8 percent dunks and 1 percent tip-ins. He's averaging more free throws per shot attempt, and while his assist rate is lower than last season, it's not a dramatic difference. Wade wasn't exactly chopped liver Thursday, either, with 25 points, seven assists, no turnovers and a dramatic block of a J.J. Redick breakaway layup. "He looked pretty damned good to me," Orlando's Vince Carter said. Yet, watching him, it doesn't seem he has the same explosion he did a year go. There have been exceptions -- a nationally televised game against Cleveland that included a vicious dunk over Anderson Varejao stands out. But one wonders whether the decline in Wade's shooting percentages is a symptom of the conditioning problem to which Riley alluded. Through Wednesday's games. Source: Synergy Sports. 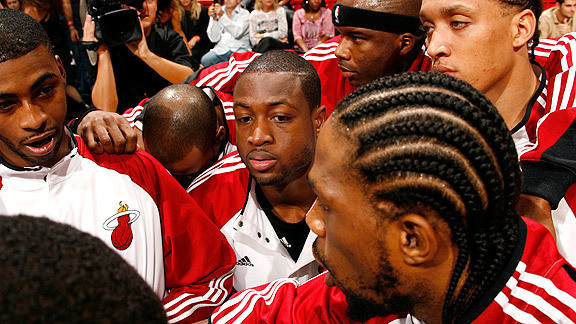 Note: 34 Wade shots missing for 2008-09; five missing for 2009-10. Just look at Wade's shot chart. He's getting to the same spots on the floor, but he hasn't been nearly as proficient from them. At every range, he's shooting dramatically worse than he did last season (see chart). Of particular note is the glaring decline in accuracy from 16 to 20 feet; Wade takes nearly a quarter of his shots from that range, so the 105-point drop is enough to sabotage his field goal percentage just by itself. Of course, opposing coaches remain unconvinced. Van Gundy said Wade's numbers will be back where they always are by the end of the season, using the classic "regression to the mean" argument that stat heads love without saying those specific words. Additionally, Wade can point to a sore wrist that has plagued him recently as a plausible reason for his diminished shooting accuracy. Unfortunately, he aggravated the wrist making the block on Redick, so if that's the problem, the Heat might have to wait a while longer for a resolution. Waiting, ironically, might be the biggest problem. Wade had little to motivate him this offseason, knowing that the Heat were essentially playing for next year's free-agent market. Without a Team USA gig to keep him sharp, it's fair to wonder whether he's using the first half of the season to get into playoff shape. Barring a dramatic personnel move, the Heat will be waiting, too -- waiting to see whether Wade's shooting numbers recover enough to make them a dangerous opponent come spring or whether his current struggles will render them no more than a .500 team that makes a quick exit come April. What's certain, especially after Thursday's rout of the defending conference champion, is that Wade has a lot more help than last season. We just don't know yet whether it's going to matter. 2. Curry On The Comeback Trail? CHICAGO -- You forget Eddy Curry is only 27 years old. Even his tattoos seem tired as he leans up against a table at the United Center, his New York Knicks team finishing up a shootaround before Thursday night's game against the Bulls, Curry's former club. He jokes about his recent weight loss, to which he will not attach a number but has been estimated at about 40 pounds less than he was last season. And as he smiles, it's hard to reconcile all he has been through. The headlines were horrifying -- violent and scary and troubling -- and all occurring in the same calendar year. First there was the sexual harassment lawsuit -- since dismissed and sent to arbitration -- filed by a male chauffeur in January. Then tragically just weeks later, Curry's former girlfriend, Nova Henry, and his 9-month-old daughter Ava were found murdered in their Chicago townhouse, his 3-year-old son Noah found unhurt at the scene. Curry, who is married to Patrice, with whom he has four children, tried to gain custody of Noah, but Henry's mother threatened to go on the run with the boy. Then in March, the woman handed the child over to Curry's family and he is now living with Curry's mother. Over the summer, the bank foreclosed on Curry's $5.6 million Chicago house [the same one that he and his family were robbed at gunpoint in 2007]. Due to a combination of his off-court troubles and injuries, Curry played just three games last season for New York. In comparison, his basketball struggles seemed miniscule. Still the questions persisted. What of his career? It was clear that Curry's weight was contributing to his frequent injuries, and there were no signs that he was working to improve either situation. Over the summer, Curry exercised his option to stay with the Knicks for another two years at a guaranteed salary of $21.7 million as the Knicks insisted on a training regimen. They are well aware of his potential. Just two seasons earlier, Curry was a force inside, averaging 19.5 points and seven rebounds. The next training camp, he reported out of shape as his numbers dropped to 13.2 points, 4.7 rebounds. ESPN.com writers and TrueHoop Network bloggers chatted with fans and gave their in-game opinions throughout Thursday night's slate of games -- all in Daily Dime Live. Jerryd Bayless, Blazers: He made the most of his extended playing time, scoring a career-high 29 points in 29 minutes. The reserve guard fired in 16 points in the fourth quarter to help Portland rally past Phoenix. Brad Miller, Bulls: In 23 minutes, he missed all five of his shot attempts, grabbed just two rebounds and didn't give out an assist, block a shot or make a steal. "I hate to say it, but before the game I saw this coming." 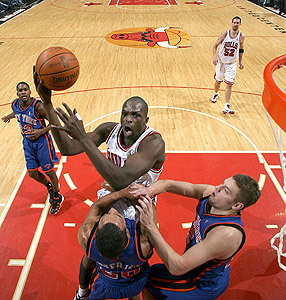 The Bulls erased a 17-point deficit thanks to 24 points, 13 rebounds and five assists from Luol Deng in a 98-89 win over the Knicks. Before the 2008 NBA Draft, Jerryd Bayless was considered a wild card. He had devastating speed, incredible scoring instincts, and as noted in a pre-draft interview, a passionate player who said his "goal is to 'kill' his man every time he steps on the floor." It's that kind of attitude that can set guys apart. The desire to succeed with that kind of drive is pivotal for a rookie. Portland's decision to draft him was curious, considering they had Steve Blake in hand and Brandon Roy at the two. In Vegas for Summer League, Bayless went off. He was everywhere, setting fire to the Vegas Strip. Even then, Coach Nate McMillan was set in his decision, telling media that the team already had a scoring two guard, his name was Roy, and that Bayless would have to learn to play the point. This was somewhat of a challenge as it meant reshaping his entire game, to be a distributor and not a scorer. Bayless struggled, was turnover prone, too ambitious and found himself married to the bench like so many high-potential players that the administration wasn't 100 percent committed to. Which is why Thursday night's game felt so big for Portland. In the midst of a semi-disastrous season after watching their franchise center go down for the season, again, and struggling with their one key free agent acquisition, Andre Miller, in both chemistry and production, the Blazers needed something positive. And Thursday night everything clicked for Bayless. Given the opportunity, he knocked down a few shots and hit some layups with that trademark devastating speed. That gave him the confidence to fight through some early turnovers. In the fourth quarter, he led the Blazers' comeback, not only finding his outside touch as the Suns attempted to focus on Roy in the lane, but looping around the basket (in a very Nash-like manner) to add four assists. And that's not including two incredible moves at the rim including a sick reverse off the feed from a driving Roy. He was patient when he needed to be, and aggressive when given the opportunity, forcing his way to the rim and picking up 11 free throws. If you prefer the total team effect measure of plus/minus? Penciled starter Blake and cranky veteran free agent Miller were a combined -12, Bayless was +12. The word you're looking for is difference maker. Perhaps just as big as the dramatic way he scored was how you could see his energy pick up the team. They responded, encouraging him, including massive props from Roy in the postgame interviews, and being consoled by teammates after he missed a clincher free throw. Bayless, who many have asked to be freed for over a year, may have finally found his way to the sky. For all the discussion of Blake versus Miller as the starting point, Bayless made a huge statement that perhaps he's ready to lay claim to the throne. That's how long it has been since the Suns last won a game on TNT after dropping their 17th straight game on the network in Thursday's 105-102 come-from-ahead loss to Portland. In that time the Suns have started (in the playoffs at least) and finished the Shaq Era, hired and fired a head coach (Terry Porter), seen Amare Stoudemire recover from a career-threatening injury and gone from an elite NBA team to a mediocre one before starting the climb back again. The only constants from that last win on TNT -- a 123-115 victory over Baron Davis' Golden State Warriors -- are Steve Nash, Stoudemire, Grant Hill, and Leandro Barbosa, who didn't even play Thursday because of an ankle sprain. The losing streak started with -- what else -- a loss to the San Antonio Spurs in Game 2 of the 2008 playoffs and has included home games, road games, blowouts, close calls, playoff games, preseason games and everything in between. Sure, they have played tough teams on TNT, but they've played tough teams on ESPN during this stretch and had no trouble dispatching them. In all the Suns are 73-38 (.658) in games not televised by TNT during this period. The Suns drew the Chris Paul-less Hornets back on Nov. 19, but an early 15-0 New Orleans run and Phoenix's passionless effort on the glass led to a Hornets upset. Thursday the Suns led 79-64 with a couple minutes left in the third quarter, but Brandon Roy and Jerryd Bayless sparked Portland's fourth-quarter tear that quickly erased that deficit. Phoenix even lost its first game all season in which Nash went for at least 11 assists after winning its first 11 such games as well as its first game when leading after three quarters. Is the TNT jinx for real? The Suns' next game on the network comes Jan. 18 in Memphis. If they can't beat the Grizzlies, it will be time to start wondering if Charles Barkley has put some sort of voodoo hex on his former team. To read more, check out Schwartz's TrueHoop Network blog, ValleyoftheSuns.com. Danilo Gallinari made six of 15 3-point shots in 27 minutes of playing time in the Knicks' 98-89 loss at Chicago. Only two other players in NBA history took as many as 15 3-pointers in one game while playing fewer than 30 minutes: Jaren Jackson of the Spurs (7-for-16 in 23 minutes in 1999) and Donyell Marshall of the Raptors (12-for-19 in 28 minutes in 2005).